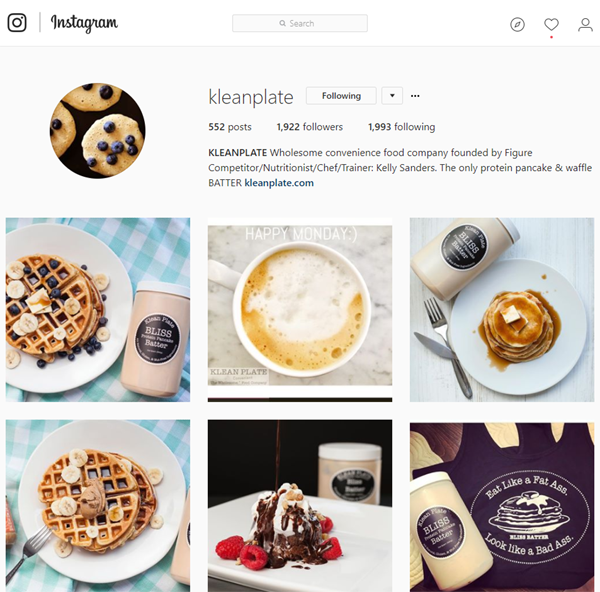 Without using another paid marketing program, Klean Plate leveraged food, fitness and nutrition influencers to grow website traffic and sales. By developing a media kit and brand guidelines, the team was able to optimize Instagram and blog exposure. 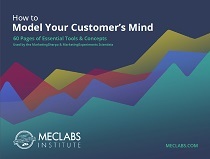 Read on to learn how the team was able to grow website traffic 204% and increase online sales 14x in just four months. A trained chef and nutritionist as well as a personal trainer, Kelly Sanders, CEO and Founder, Klean Plate LLC, started the company a little under a year ago. Sanders decided that her combined talents could be an opportunity for a successful meal delivery service, and Klean Plate was established. “I was cooking for my clients. It grew beyond me very quickly. There's a lot of demand for healthy, nutritious meals, and I could not keep up with the demand,” she said. So, she pivoted the model from a meal delivery service to a product line. Klean Plate’s first inaugural product was formerly the most popular menu item — a protein pancake and waffle batter. “That launched in November, and we've become an ecommerce model. We're retailers, and we've been using social media heavily as a way to market ourselves,” she said. Even before Klean Plate, when Sanders was working as a personal trainer, “I realized how powerful social media was, because you become your own influencer — if I liked a product, I would let my clients know,” she said. Once the business launched, Sanders said she knew that it was going to be an important tool they wanted to utilize. “We've gotten a lot of orders just through social media marketing,” she said. When the brand got into influencer marketing, Sanders knew she wanted to find people who were local to the area, particularly “female fitness foodies.” She was initially doing a lot of the legwork herself. Later, she began working with an influencer marketing vendor. “I was able to do a really nice finite search. It wasn't until then that I really saw that if someone, let's say with even 40,000 followers, if they did a post, our sales would go up. It was work smarter, not harder,” she said. “[Identifying influencers] was a learning process, to be honest,” Sanders said. When she first started searching, she was looking in the Boston area, because the company is only able to distribute in the New England area currently. Typically, she said, most influencers are food bloggers, and on Instagram. “There were a lot of people who met our search, but they were maybe in California or Colorado. That wasn't going to cut it,” she said. Sanders would reach out to the influencers she identified and offer them a product sample to try out, and then hopefully, they would post about it. Eventually, she expanded her search and even included some UFC fighters in her roster of influencers. “Honestly, these people do have a lot of followers. This is their full-time job — being a blogger. But … especially with the women, it was supportive of fellow female entrepreneurs, and they gave me a lot of tips,” she said. There are different tiers, she said, depending on how many followers an influencer has, and you would have to pay them. “But a lot of them were willing and understood that I'm a grassroots startup, and they were OK to do a post if I just offered them the free sample, which I was very grateful for because I knew there was value in their post,” Sanders said. In the beginning, she began working with a fitness and healthy eating influencer who had a large following in the Boston area. “She does a lot of exercise videos and healthy eating, and she's also a mom. I thought this would be perfect. I met with her in person and gave her a sample,” she said. Sanders said that it was a great learning experience. For example, she didn’t provide the exact wording for the blog post, but gave suggestions. Sanders gave another example. 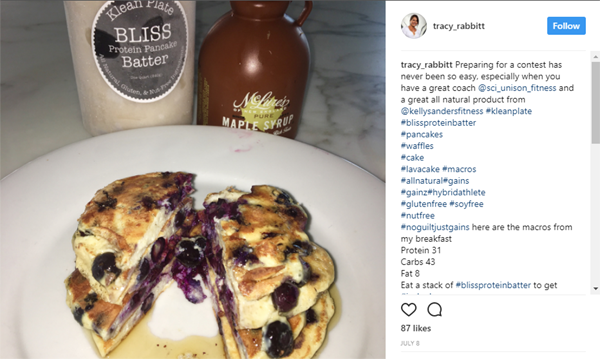 The main value proposition of the product is that it’s a healthy, protein-filled pancake, but the post didn’t effectively get that message across. “It was good to get the exposure, but it was not the best wording. So, I soon learned that I need to create a media kit for the influencers that would provide them the least amount of work for them,” she said. At this point, Sanders had a part-time employee whose sole responsibility was to work as an influencer with 20,000 followers herself. Sanders also entrusted her, as an influencer, with creating the media kit that would be most helpful. It included images, brand hashtags as well as specific language for posting on different platforms. Sanders has some personalized hashtags that are strictly for Klean Plate but also pairs that with hashtags that have a large following and might get the brand some attention. For example, “#CheatMeals, #ProteinPancakes, #CleanEating, #CompetitorLife, #HealthyLiving; even #FoodPorn is a big one. Then we have our personalized Klean Plate. We have #Blissed because we're Bliss batter instead of blessed. We have #LifeDon'tGetBatterThanBliss, and obviously #KleanPlate,” she said. After the initial influencer learning experience, the team decided to overcommunicate with influencers, rather than assume. “It was really important to be really, really clear and precise … [in] creating this kit that was flawlessly and seamlessly easy for them to follow,” she said. 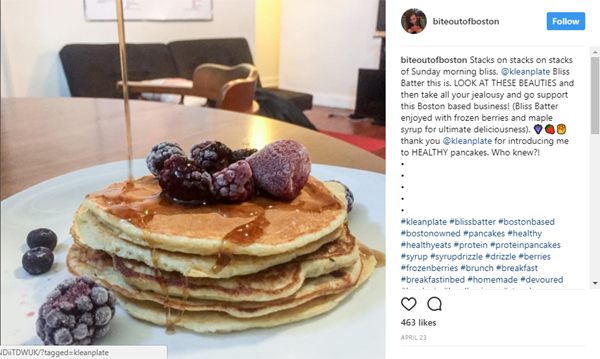 Sanders said she wants to create a network for all of the Instagram influencers and even throw networking events since most Klean Plate influencers are located in the Boston area. “That is something that's in the works right now. We posed it like a one-year anniversary being an influencer with us and doing continued posts with us,” she said. Community events like this encourage influencers to become invested in the brand and continue posting about it. “That was to encourage almost a competitive atmosphere for the influencers to continue posting, and then if you get this many likes, we'll have you as a more secured influencer,” she said. Continuing the relationship is absolutely vital, Sanders said, and building that community can be done in even more simple ways than hosting a branded event. This keeps up the buzz and excitement around the product for influencers. Social Media Marketing: Should I include paid influencers in my marketing spend? Marketing Research Chart: How likely are consumers to follow influencers’ recommendations?